TJ Johnson flying an early prototype of The Pocket Drone. With a few more days to go, The Pocket Drone has raised $766,041 from 1,644 backers on Kickstarter. 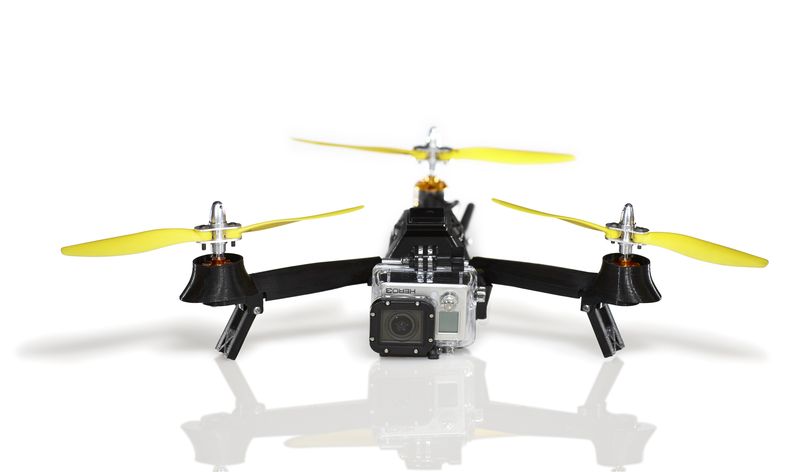 It is by far the largest, most successful drone Kickstarter project ever. But behind the company, AirDroids, the slick marketing and now the big money, is a “maker” named T.J. Johnson. I spoke to him at length about the design process. Over the course of a year, T.J. built 87 prototypes over 40 design iterations before setting it free. And yet, it was a decision he struggled with. It’s difficult to grasp as an engineer. I’m always thinking of ways to make it better. I don’t think I would know when something is ever “done” or ready, but eventually design changes became smaller so that’s when I knew it was time. Business demands also played a role. Getting it in TechCrunch’s Hardware Battlefield at CES was certainly an effectual pre-launch marketing strategy. Did you know? The original Pocket Drone design was a quadrotor. It didn’t have enough power to carry the weight. Version 4: Tricopter design introduced. Looking back T.J. says he was always informally a “maker” but got more serious about it six to seven years ago while still an engineering student. I needed a part for my motorcycle that I couldn’t buy. So I had to figure out how to make it. That foray into servo motors and embedded systems spun into a for-hire design and prototyping shop, which required him to build more things. Building more things helped develop his passion. It started out as a need. I couldn’t afford the professional high-end equipment I needed for jobs so I built my own CNC machines. I found (drones) fun. I liked it. And I thought, “if I liked it, other people would too.” For me it’s being able to turn something I enjoy doing, a personal passion, into something that everyone can enjoy. 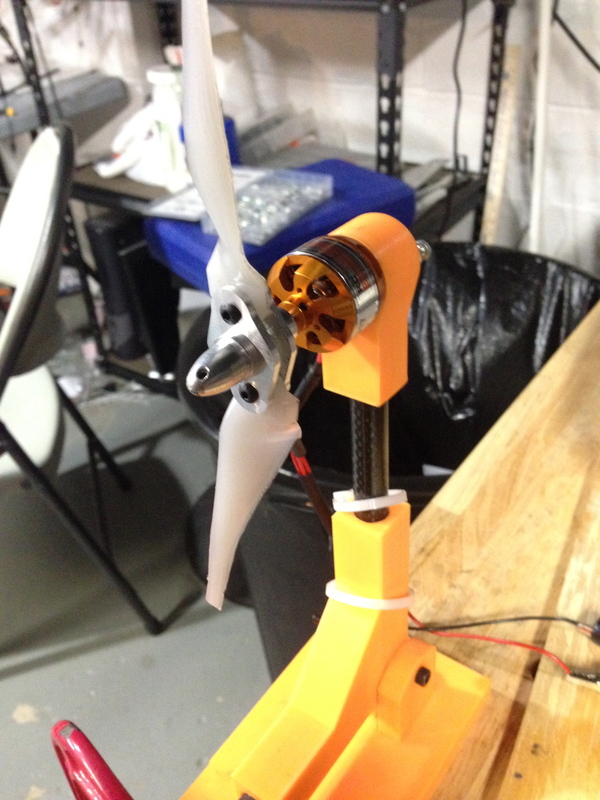 3D Printed motor test stand. After graduating with a civil and mechanical engineering degree he moved to the East Coast to pursue law. Here in Washington D.C., he could barely afford rent let alone a shop so making was put on hold. T.J. then found D.C. hackerspace HacDC, which had a CNC mill, oscilloscopes, logic analyzers, a hot air reflow station and other tools he needed. I signed up so that I could make things again. They had a CNC mill that wasn’t being used to its potential so I started teaching classes on that. At HacDC, there was a great community of support for everyone’s projects. It’s because of that experience that I really enjoy staying involved in the maker community. 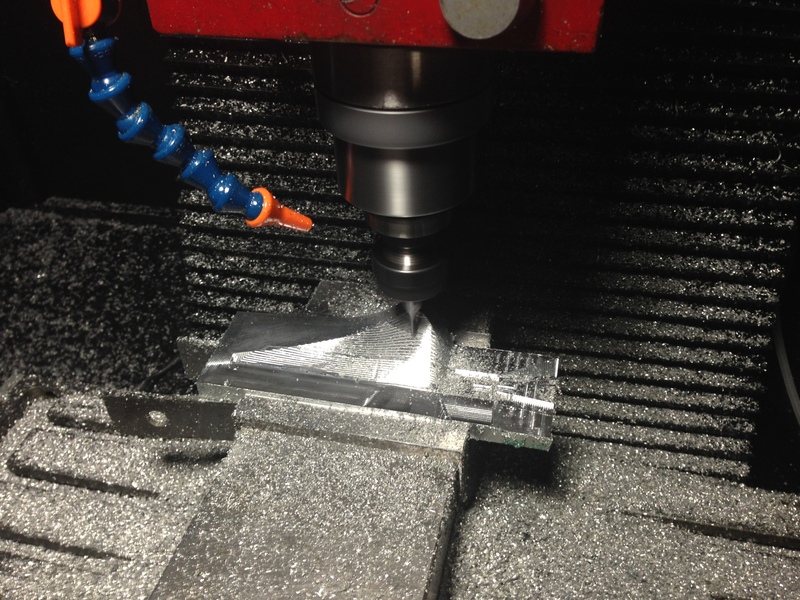 First propeller mold coming off CNC. 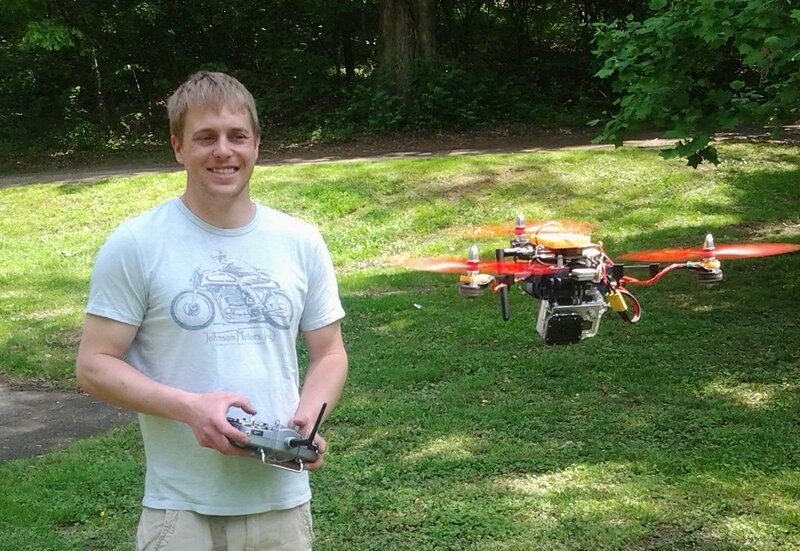 HacDC provided not just the tools, but the community that allowed him to meet other engineers and eventual business partner, Timothy Reuter, Founder of the Drone User Group Network. T.J. credits Timothy for keeping him honest on form while he focused on function. He kept telling me to make it prettier, which wasn’t easy. A few of the designs didn’t work. Version 18: Failure at making it pretty and work. One of the more important tools used to design The Pocket Drone was a first generation Prusa Mendel 3D Printer. It was the acquisition of a 3D Printer, he says, that allowed him to begin prototyping and iterating the Pocket Drone in earnest. T.J. first started modeling the parts in plastic then milling them on the CNC mill before deciding to just prototype in plastic. I eventually figured out that the (plastic) parts were structural parts. I realized I could skip milling the parts in metal and just print in plastic. This reduced our iteration time dramatically. Version 35: 3D Printed arm covers to make it “prettier”. It’s been said that the biggest risk of launching projects on Kickstarter is oversubscription. 3D Printing seems to have the answer to that, too. 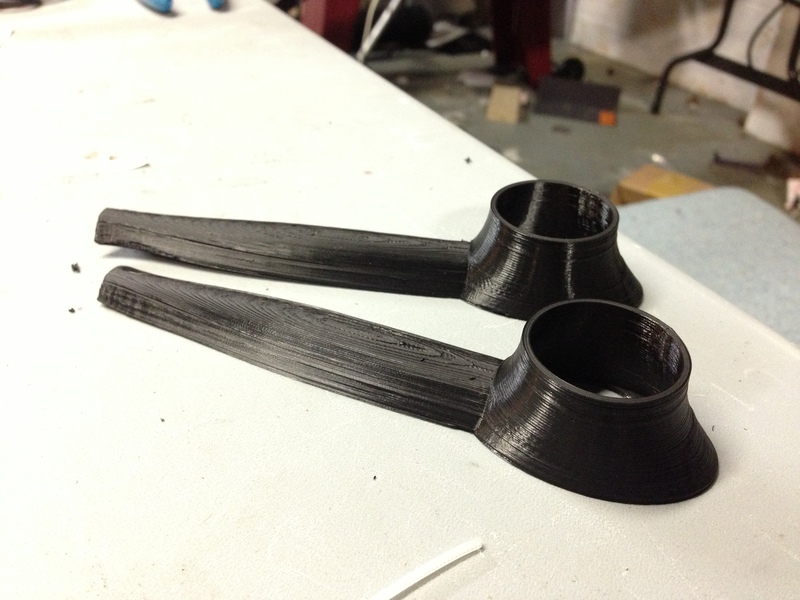 You can take those 3D printed (plastic) models to an injection mold process and have it scale. 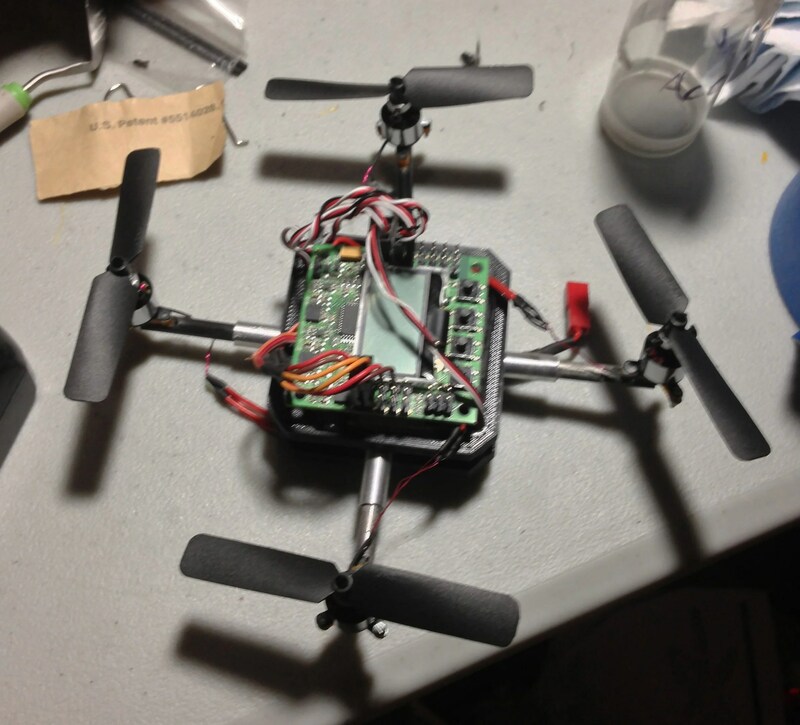 The Pocket Drone uses the popular open source UAV autopilot APM developed by the Arducopter community. If we had to build our own flight controller from scratch it would have taken another five years doing this full time to get this product to market. Opensource UAV platforms have really facilitated this kind of rapid product development. What would you do with all the extra funds? T.J. says the unexpected additional support means backers will get a better product and funding will support further development. The scale we priced the product at was a few hundred or so. Now that we are at the scale of a few thousand we can afford to put in better servos for example. We also want to hire four or five software engineers to build out more features like better synthetic vision; we want to add iOS support and improve flight control. By the way, if you haven’t backed The Pocket Drone yet, you better hurry. The funding period ends at 3am Sunday, March 9. When the Pocket Drone was first released, there was chatter about some of the claims. Kevin Good of CrisisLabs demonstrates flight and how video footage taken with the Pocket Drone looks.